But there's good news for anyone who looks forward to a zero-waste future. Many restaurant operators are taking steps to divert food waste from the landfill, and composting programs are one of the major (if not the major) tools they use to do it. While source reduction and donation are important strategies for the ecologically-minded restaurant owners, pioneers of the zero-waste movement have discovered that they can't solve the food-waste puzzle without composting. In fact, because all organic matter can be composted — and because compostable packaging and other foodservice products are now widely available — composting may be the restaurant industry's most promising path to 100-percent diversion. For proof, simply ask two of the pioneers of industrial-scale composting in the quick-service restaurant space: The Pacific Northwest's Taco Time and California's Amy's Drive Thru. Representatives from both organizations participated in a 2018 webinar hosted by the nonprofit The Composting Collective, and the lessons they learned are invaluable to any restaurant-industry insider who wants to learn more about the benefits and the challenges of composting in foodservice. We didn't enter into the composting program with this idea in mind to begin with,...but this has ended up being a huge competitive advantage for our company locally. Our customer counts over the first five years of our composting program are up over 40 percent. Sales are up more than that. Because we focused on committing to 100 percent compostable, it's really become part of our story as a company. Noting the positive response from consumers at Taco Time’s Seattle locations, managers decided to introduce the composting program at all 78 of their locations across the Northwest. This gave them the advantage of economies of scale, buying as a system to create branded compostable packaging for all their locations. Costs for packaging have gone down with expansion to the whole franchise. In 2017, Taco Time delivered over 11,000 cubic yards of usable compostable material from the landfill. They reduced their carbon footprint by the equivalent output of 220 cars on the road or 165 households every year. The company creates more than 37,000 bags of quality compost every year. "This has been such a powerful tool for us," Benson said. "It's been such a positive impact." Of course, in order to derive the full benefits of composting, you have to close the circle by using composted fertilizers to grow food. The fossil fuels used in the creation of chemical nitrogen fertilizers can make up more than 50 percent of the total energy used in commercial agriculture, according to the British journal Philosophical Transactions of the Royal Society B: Biological Sciences. That means a wholesale move to compost-based fertilizers could cut carbon emissions by as much as half in the agricultural sector. To succeed at restaurant composting, though, operators will have to confront a few challenges. Clearly, this requires cooperation. Restaurant staff can really only handle steps 1, 2, and 6. Creating these partnerships is the first challenge for any restaurant operator interested in organics recycling. In order to succeed, it is vital to reach out to haulers, composters, and governments — at the local, state, and possibly even federal level. Staff Training — With turnover rates in the hospitality industry hovering around 70 percent in recent years, it can be challenge to train back-of-the-house staff on a multi-bin system. Customer Education — A similar problem exists in the front of the house, where signage must be clear and simple to keep organics bins uncontaminated. Overcoming Industry Inertia — Composting is still not widespread within the industry. According to the National Restaurant Association's The State of Restaurant Sustainability 2018 report, only 14 percent of operators composted any food waste at all. Of that 14 percent, 1 percent only composted plate scraps, 4 percent composted scraps produced during the cooking process, and 9 percent composted both. Concerns Over Pests and/or Odors — A well-designed composting program won't have problems with insects, rodents, or bad smells in the dining room. Still, some people associate composting with these issues. Regularly emptying organics bins with the help of a hydraulic Bin Tipper keeps kitchens and dining rooms fresh and sanitary. Organics Bin Contamination — This is probably the greatest threat to composting programs at restaurant locations. As much as possible, simplifying waste streams is the best option. In some respects, full-service dining establishments have it easier than their fast-casual counterparts. Trained restaurant staff are much more likely to keep compost and recycling bins uncontaminated than the general populace. Two-bin to Three-bin: Most fast-casual restaurants in the U.S. currently operate under a two-bin system, one for trash and the other for recycling. The first way to add composting to this material-management plan is to set out a third bin. The trouble is, customers are often in a hurry, and they might not take the time to carefully separate out the objects on their trays into three separate waste streams. It only takes one careless diner to contaminate an entire bin, and few restaurants can spare the staff-hours to sort through the compost after every lunch rush. Two-bin to Single Bin: The other option, then, is to eliminate the burden of choice. Instead of going from two bins to three, both Amy's and Taco Time found the key to near-100-percent diversion when they went to a single-bin system. The single-bin system is, of course, devoted entirely to compostables. With the right materials, nearly everything can be compostable. Both Amy's and Taco Time replaced as much of their packaging and materials with compostable products. That's everything from packaging to napkins to disposable cutlery. The nonprofit Biodegradable Products Institute, or BPI, publishes an updated list of certified providers of compostable foodservice products. This is an excellent resource for restaurant operators looking to make the move to sustainable single-bin waste management. Search the BPI database of certified compostable product providers here. Taco Time and Amy's make excellent case studies for QSRs moving toward zero-waste, but it's important to note that these companies were spurred to their efforts by the introduction of local ordinances. Taco Time began its composting program in Seattle, which introduced a blanket ban on non-recyclable or non-compostable products packaging for food service providers in 2010. As part of the same law, a ban on non-compostable straws and disposable dining utensils went into effect July 1, 2018. It was this law that first inspired Taco Time management to study the switch to a post-use materials management program with composting at its center, explained Benson. The public response to the Seattle waste diversion policy was so positive that the franchise expanded it to locations that aren't legally bound to keep waste out of landfills, but it's important to note that the movement began at the civil level, not the corporate one. The story of Amy's Drive-Thru follows a similar dynamic. The restaurant currently operates only in California, which has some of the most stringent environmental protections in the nation. In 2014, Governor Jerry Brown signed Assembly Bill No. 1826, which requires businesses in the state to establish organics recycling programs — that is, composting. This is not to say that either company was motivated solely by the law. Reducing waste is part of both businesses' corporate philosophies. We bring up the role of these statutes by way of demonstrating that legislative action is probably a prerequisite to an entirely waste-free foodservice industry, no matter where you live. There's no reason for restaurant operators to wait for the laws to catch up to consumer demand, though. To learn more about how to create a restaurant composting program and other ways to reduce food waste, download ReFED's Restaurant Food Waste Action Guide here. 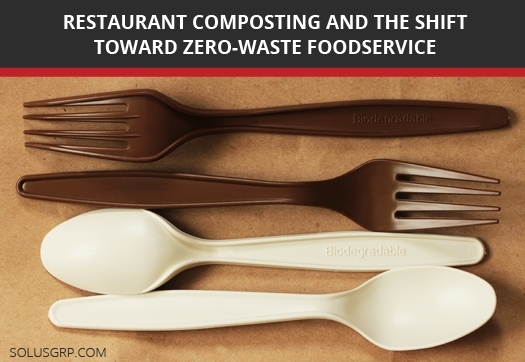 "Diverting Food Waste to Composting: The Foodservice and Restaurant Perspective." Readytalk. Composting Collaborative, 17 Apr. 2018. Web. 19 June 2018. "Food Service Packaging Requirements." Seattle. Seattle Public Utilities, n.d. Web. 19 June 2018. "Mandatory Commercial Organics Recycling (MORe)." CalRecycle. California Deparmtent of Resources Recycling and Recovery, n.d. Web. 19 June 2018. "Restaurant Food Waste Action Guide." ReFED. ReFED, 2018. PDF. 19 June 2018. "The State of Restaurant Sustainability 2018." Restaurant. National Restaurant Association, 2018. PDF. 19 June 2018. Woods, Jeremy et al. "Energy and the Food System." NCBI. Philosophical Transactions of the Royal Society B: Biological Sciences, The Royal Society Publishing, 27 Sept. 2010. Web. 19 June 2018.